miniOrange OpenID Connect SSO Plugin acts as a OpenID Connect Identity Provider which can be configured to establish the trust between the plugin and various OpenID Connect Service Providers to securely authenticate the user to the Joomla site. miniOrange Cross-Domain Joomla Site SSO Plugin can share the login between two Joomla website(Cross domain,same domain or sub-domain) by simply adding the other Joomla site URL in the settings, where you want the login to be shared. And adding the HTML button on the current Joomla site which will login to the other Joomla domain.Please make sure you have installed and enabled this plugin on both the Joomla sites. Follow the Step-by-Step Guide given below for Joomla Single Sign On (SSO) for SAML. 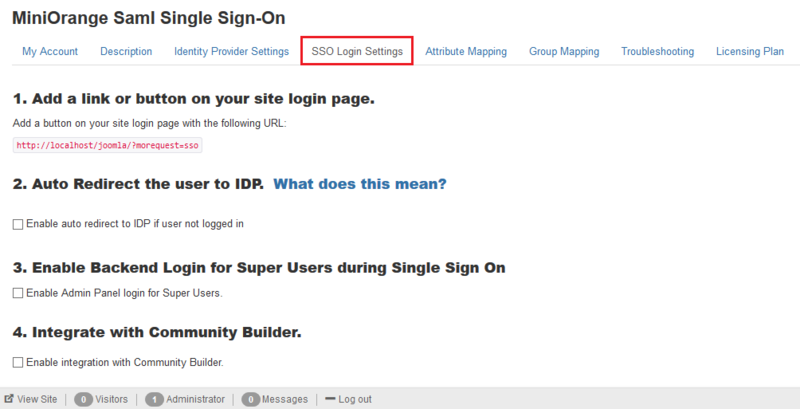 Step 1: Configure Single Sign-On Settings in your Idp. Click on Extension Manager under Extensions. Choose miniOrange Joomla plugin file to install (i.e. miniorangesaml.zip). In the Joomla admin interface, click on Plugin Manager under Extensions. The Plugin Manager allows you to enable and disable Joomla plugins and to edit plugin details and options. It is also useful for quickly enabling or disabling multiple plugins at the same time. Click on the plugin name and go to Identity Provider Settings tab. Once the settings are done enable the plugin from the Plugin Manager. Click on Template Manager under Extensions. The Template Manager can be used to edit files, create files and folders and even create overrides directly inside your admin area. Overrides created in this edit screen are Template overrides and not to be confused with Layout Overrides. Click on Templates in the sidebar. Select the site template that is currently being used (for example: Protostar). Now select default_login.php under html->com_users->login. Search for the JLOGIN button in default_login.php. Edit the base path in the login link to your joomla site url. You can customize the look and feel of the link according to your theme. You can convert it to a button if you want. 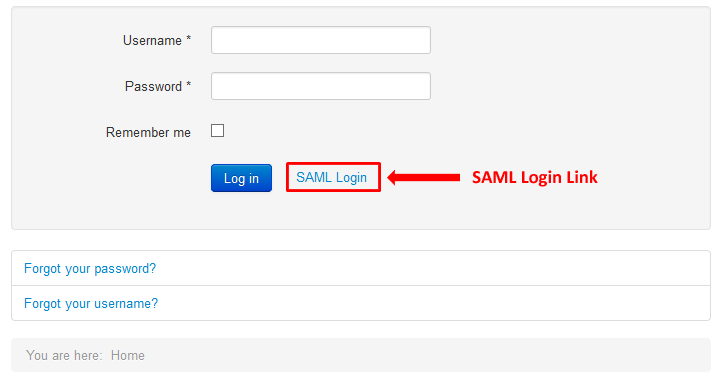 After successfully completing all the steps, a SAML Login link appears on your user login screen. You can see the sample Joomla site screen below. When you click on the SAML Login link you will be redirected to your Idp login page. Follow the step-by-step Guide given below for Joomla Cross Site Domain login. With this feature you can share the login between two Joomla website(Cross domain,same domain or sub-domain) by simply adding the other Joomla site URL in the settings, where you want the login to be shared. And adding the HTML button on the current Joomla site which will login to the other Joomla domain.Please make sure you have installed and enabled this plugin on both the Joomla sites. Also the user with the email must exists on both the sites. Choose miniOrange Joomla plugin file to install (i.e. miniorangecrossdomain.zip). Step 2: Configuring the plugin. Click on the plugin name and go to Cross Domain login settings tab. Enter your random shared secret key. Replace the existing shared key with your own key. It must the the same on both the Joomla sites. Now you can add link anywhere(Articles, modules, pages) in this Joomla site which will login you to other Joomla Domain. Copy and paste the following link anywhere in your site to login into a different Joomla DOMAIN. Step 1: Create a user in miniOrange. Go to miniOrange login . Register a new account by clicking on Sign up for a Free Trial. Go back to miniOrange login and login with your credentials. Go to Users/Groups-> Manage Users/Groups-> Add User and add users. Select the Application Name as OpenId Connect from the drop down menu. Click on Save to configure the OpenID Application. Note down the Client ID and Client Secret from Edit application. Add a new policy for Joomla. You can download the plugin by logging in as a customer from Admin Console of miniOrange's Administrator Console and clicking on Guide to Secure Joomla from Dashboard by selecting OpenId from tab. Choose miniOrange Joomla component file to install (i.e. com_miniorangeconnect.zip). Provide the required settings (i.e. Client ID, Client Secret) and save it. Once the settings are done copy the generated code to the Login form. Step 6: Adding OpenId Connect "Login with miniOrange" link in Joomla Login form. Now select default_login.php under html->mod_login->default_php.php. Copy and paste the generated code just above the following code in default_login.php. Now the login form will have "Login with miniOrange" just above forgot password link. Why should you pick our Joomla plugin over other plugins that are available? A single sign on service for 3000+ apps (whether they are standards based or not), besides Joomla, like Google apps, Salesforce etc.